Angry Asian Buddhist: Happy Asian Pacific American Heritage Month! 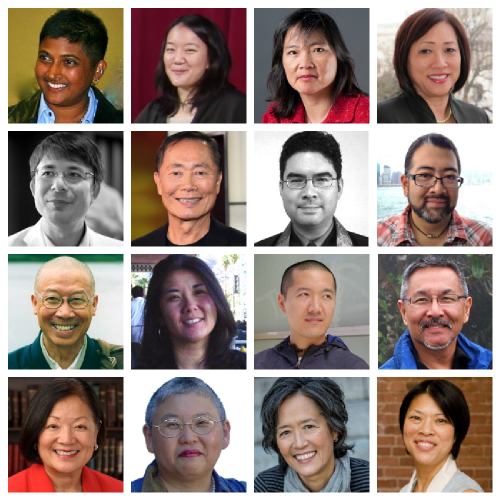 If I had more time, I would celebrate Asian-Pacific American Heritage Month by writing a post about every Buddhist Asian American who has a great story to share. I would write about issues that affect the lives of Buddhist Asian Americans. I would essentially do all the things that I try to do every day on this blog. So this year I did something different. I made a collage. I was surprised. I’d never seen Buddhist Asian Americans presented like this before. Placed together are the portraits of the first 16 Buddhist Asian Americans whose photos I could find with Google image search. Here you have writers, activists, politicians, consultants, professors and Dharma teachers. I could have gone on, but I need to rest before running the Bay to Breakers in a few hours. In the past, I’ve caused a stir by making the exact same type of collage with photos of Buddhist Geeks conference speakers, the editors of Shambhala Sun and the contributors to a magazine feature on women in Buddhism. Those collages demonstrate how American Buddhism’s Asian majority are repeatedly marginalized from prominent discussions about Buddhism. This image reminds me that there’s still so much more to write about Buddhist Asian Americans. The portraits remind me that we cannot be described by the coarse stereotypes of Oriental monks, superstitious immigrants or banana Buddhists. We have incredible stories to share with you—if only one takes the care to look for them.